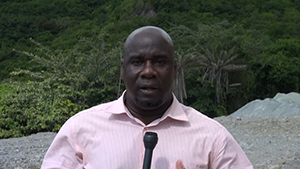 NIA CHARLESTOWN NEVIS (October 30, 2014) – With the New River quarry back in the hands of the Nevis Island Administration (NIA) and managed by the Nevis Housing and Lands Development Corporation (NHLDC), it is helping to reduce the cost of government projects on Nevis. Minister of Communications, Works and Natural Resources Hon Alexis Jeffers, made that disclosure at the end of a recent visit to the quarry where he gave the Department of Information an update on the ongoing operations there. 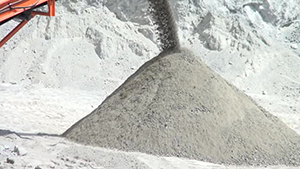 “In October of last year, the Nevis Housing and Land Development Corporation would have assumed responsibility for this quarry once again and we set about putting in place a structure and putting in place certain things, we believe, could turn this around and make some money for the government. Albeit, not much money per say but at least, we are hoping we won’t make the type of losses that we made under the previous Administration. “So we bought ourselves a screen that we have been using to sift some material that is being used over at Brick Kiln, on the Caribbean Development Bank water project that is ongoing. We have actually been screening top soil. We also have had some aggregate, that we consider to be by-products of this material,” he said. According to Mr. Jeffers, the move was also an attempt to bring added revenue into the Administration’s coffers. 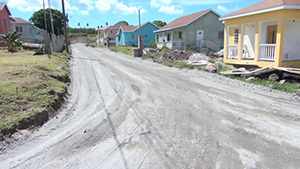 “It is essentially an attempt on our part to bring in some revenue for the Nevis Housing and Land Development Corporation and by extension the Nevis Island Administration and also to cut down on the cost of road construction. “We are selling this base material to Public Works for just $15 a yard and that can be considered to be a royalty fee. It costs to cut the material. It costs to transport it but we believe, that there must be something paid for the services we are offering to the Public Works Department,” he said. The Minister noted that since the changeover, there had been considerable success and expected it to continue with other projects planned. “I can say so far so good and indeed we have supplied material for the project at Hamilton, Colquhoun Housing Development where the Nevis Housing and Land Development Corporation is constructing work and also there are bits and pieces of work that have been done since we have been in government. “We have a huge project to undertake at Hanley’s Road and so this product will be needed. Then we are we are going to Brown Hill to do the Brown Hill Road over the next year or so. Then of course, we have that major challenge from Shaws Road to Fountain. That would be done in 2016. So we are gearing up ourselves here at the government quarry and putting some things in place, so that we can be the supplier to perhaps not only the government but also to private entities,” he said. However, the Minister stated that the move was not intended to compete with persons in the private sector. “Over the year and a half we have been in government, we have realised that persons have been utilising the resources of government land. These are lands that they don’t lease, they do not have any title or entitlement to but they have been using those resources to make money which is unfortunate…The resources that are on government property belongs to the entire island of Nevis…This is government’s property and as such the entire island of Nevis is going to reap the benefits,” he said. Mr. Jeffers explained that the quarry was discovered in the late 1900s-2000 by a worker of the NHLDC and the material there was considered the best quality for road work and since then several pieces of road on the island were constructed with use of material from the quarry. 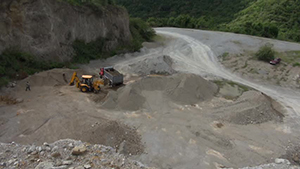 The quarry was later leased by a subsequent Administration who had given permission to a foreign company who had mined millions of yards of material for the construction of roads on Nevis at excessive costs. “We would have seen from the records that the cost per yard to the Government, using the government’s resources or the people of Nevis’ resources was in the region of $190 per yard. That is indeed expensive and that is what would have inflated the cost of roads projects here. “We believe if this resource belongs to the people of Nevis, it’s under the control of the government then, we should derive all of the benefits and savings that should be received from the usage of this material,” he said. 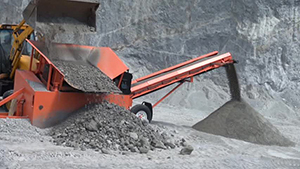 Since the sitting Administration regained control of the quarry, the NHLDC had invested in equipment, among them a sifting machine, to keep up with the demand for material there. Mr. Jeffers urged operators to care for the equipment. “We invested in repairing these pieces of equipment – our two backhoes, our excavator and the truck that we have up and running now. I am asking the operators of this equipment and the truck, for example, to take care of them because we intend to have those for many years to come to do what we have to do. “If we are able to provide the trucking, of course, we should be able to offer some significant savings to our customers because we do have quite a bit of construction to do in the housing sector and that is booming as it is,” he said.